Child & Family Sessions: $250; up to 4 people ($25 each additional). 1 hr. on-location photo session; includes 10+ professionally processed digital images. 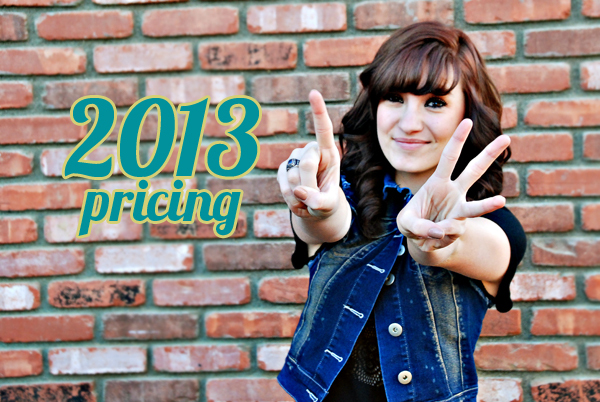 Senior | Grad Session: $300; 1 - 2 hr. photo session; includes 3 looks, 20+ images professionally processed images digital images. Custom graduation announcements available. Maternity & Newborn Sessions: $500; 1 hr. Maternity Session should take place between 32-36 weeks. Newborn Sessions should take place within the first 7 days but no later than 14 and can last 2-4 hrs. You'll receive 20+ professionally processed digital images from each session. Custom birth announcements available. Newborn Only Option: $300; 2 hr. in-home photo session within the first 14 days of life; includes 20+ professionally processed digital images. Custom birth announcements available. 3, 6, 9 Sessions: $400; 3 30 min. on location photo sessions within the first year of life, ideally the third, sixth, and ninth months. Does not include a newborn or Smash the Cake session. Includes 10+ professionally processed digital images from each session. **NEW First Birthday / Smash the Cake Session: $250; 1 hr. on-location photo session documenting a 1 year old old smashing their first cake! These first birthday sessions are uniquely stylized by Joleen Pete but do not include the cake. Includes 20+ professionally processed digital images. Ideas/themes welcome! Ask about our new PORTRAIT PARTIES by Love, Joleen Photography! Special Events: Special event photography is available starting at $150 per hour. There is a 2 hr. minimum. All events include all professionally processed digital images. Wedding Photography: Please contact me for a custom quote. Model Testing | Commercial | Product Photography: Please contact me for a custom quote. 5 x 7 Flat Cards with High Quality Colored Envelopes - $100 for first 25. $75 for every 25 thereafter. Refer 3 friends who book a family session or portrait party and receive 25 custom mommy play date calling cards ($45 value) and $50 off your next family session. Refer 5 friends who book with Love, Joleen Photography within one year of your session or party and receive a 1-hour complimentary family session, which includes 10+ professionally processed digital images ($250 value). Love, Joleen Photography is currently serving the Greater Atlanta area. For updates and specials Like Us on Facebook! *Pricing is subject to change without notice.